Everyone knows the Achilles’ heel of electric vehicle are limited range and long recharge time. A lot of time and money is being spent trying to change that. Lithium-air batteries are a promising technology that theoretically could create batteries the same energy density as gasoline. We’re still a long way from that happening, but research suggests we could see lithium-air batteries that hold 5 to 10 times as much energy as lithium-ion batteries of the same weight and double the amount for the same volume. 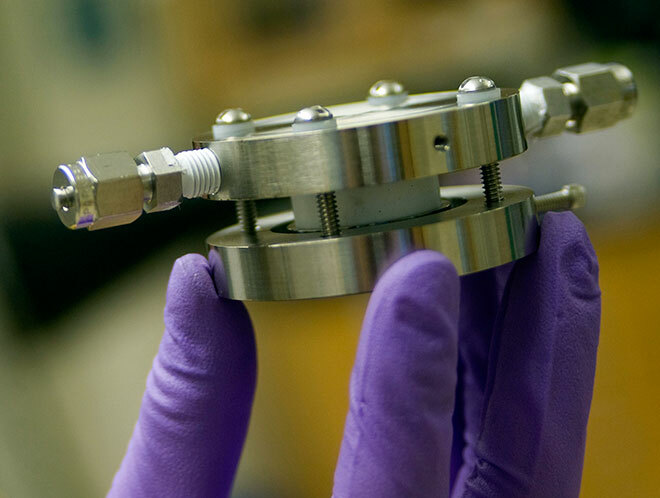 “No other battery has that kind of energy density, so far as we know,” Ming Au, principal scientist at Savannah River National Laboratory, tells IEEE Spectrum. This lithium-air test battery has an inlet and an outlet to allow air to flow, providing oxygen for the battery’s operation. The promise of smaller, lighter batteries that pack a greater punch than anything on the market could boost the performance of everything from laptops to electric vehicles like the Nissan Leaf. Such batteries use a lithium anode and a cathode comprised of a porous material that draws oxygen from the air. The lithium combines with oxygen to form lithium oxide and release energy. Because the oxygen comes from the ambient air, the cathode is lighter than that of a li-ion battery, giving lithium-air batteries far higher energy density. The lab has demonstrated a coin-sized rechargeable lithium-air battery with a density of 600 mAh/g, far higher than the 100 to 150 mAh/g of lithium-ion batteries.